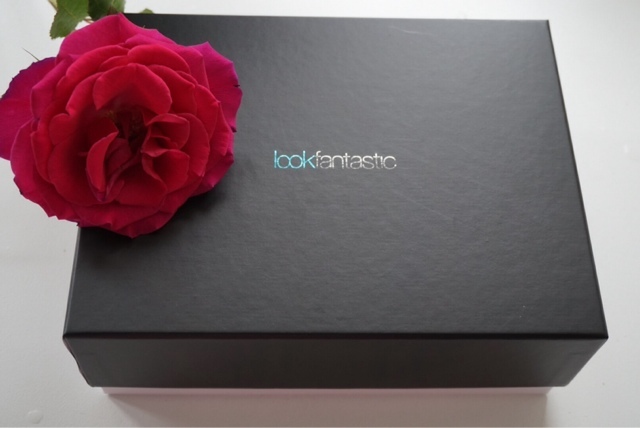 You may have seen the #LFbeautybox flying around twitter amongs beauty bloggers over the last week or so and you may have realised that the hashtag is connected to this little beauty box right here. I will admit that I've always been quite skeptical about a monthly subscription beauty box and never had the urge to give in to the hype or sign up to one. This was simply because I felt like in each box there was bound to be one product that I wouldn't like or get any use out of and I would end up with tons of unloved samples. 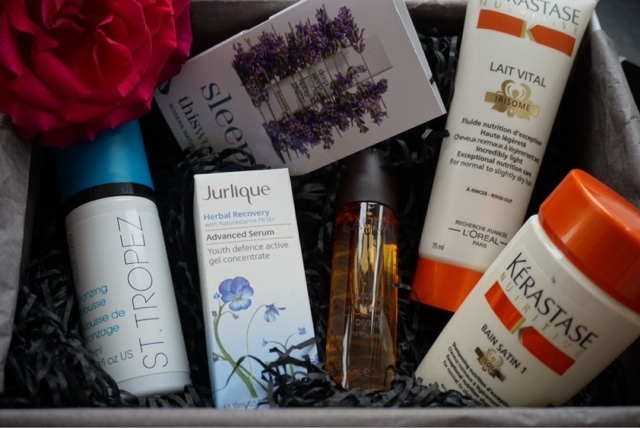 However this box caught my eye last week after it had been mentioned in a post by Adrienne from The Sunday Girl and then later on tweeted by Brenda from Brenda Busy Bee (something mentioned by two of my favourite bloggers had to be given a second look). 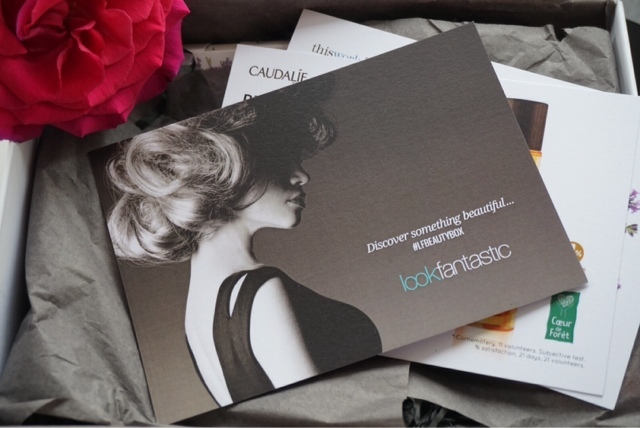 Off I went clicking onto Look Fantastic website and in a moment of madness I ordered myself the beauty box. I figured I had nothing to loose since it was the first box from this company and I could buy it as a one off rather than a subscription. Costing me £15 (even though it was valued at £54), I knew I would get my money's worth somehow. What intrigued me most and gave me that final push to buy it was the great idea of offering of a mystery gift in a few selected boxes, which a few lucky people could receive! 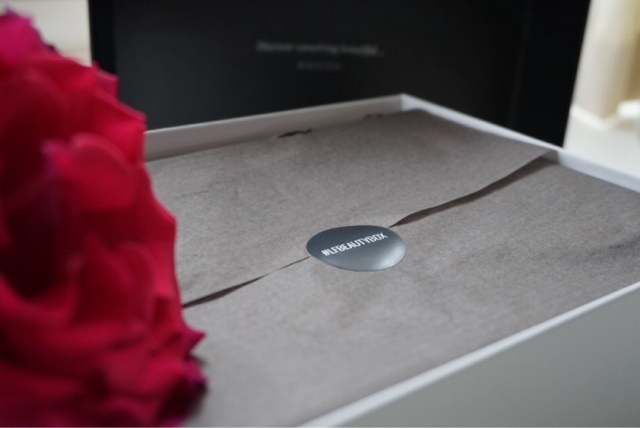 I loved this idea and hoped for it to be me straight away, but sadly the mystery gift was not ment to end up in my hands, however the beauty box did arrived last Thursday and I am surprised at how much I like the products inside. I've barely got the chance to try the products so this is just a first impressions post. The item I am most excited about and one that I am waiting (patiently) to try till I finish my current product, is the Jurlique Herbal Recovery Advanced Serum. I have been seeing so many amazing reviews on this luxe brand but just haven't managed to get my hands on it yet! I feel like this is the perfect product to introduce me to the brand. Although it's not the full 30 mls size it's definitely enough to get a good feel for it and see how my skin looks whilst using it. I'll be sure to fill you in on this once I give it a good testing. Next up the Caudalie Divine Oil which I'm really intrigued to try and the 10ml travel size will be perfect as with any oil a small amount can really go a long way. I will try give this a go on mainly the driest areas of my face and as an overnight hair mask also, since my hair has not been looking great lately. Looking forward to see the effects of this product and of course I'll be letting you all know how I get on! I'm so curious to try the This Works Deep Sleep Pillow Spray on those nights where I just can't get my brain to shut off making it really difficult to fall asleep. Since blogging I find myself staying awake later on social media trying to catch up with everything. It's really bad not taking a break from it all once in a while so think one night a week I will opt for a pamper night and a book instead of social media where I'll be sure to use this and see if it calms me down and helps me sleep. I never give my hair any pampering or even much love for that matter, it's just one part of me that always gets overlooked and at the moment I feel like it's definetly looking a little sad. So I am really excited to be using up the Kerastate Nutritive Duo, as I've always read raving reviews on this brand and I know that I probably wouldn't get the chance to try it out other wise (since I don't like spending an awful lot of money on my hair). Hoping to see some improvements from using this duo and I'll be reporting back to let u know how I got on. The item I'm least excited about is the St. Tropes Self Tanning Mousse, because I'll just admit it now that I have never used tanning products before. I love getting a natural tan from being away or not having one at all, as the effort that you need to put into fake tanning is something I've just never been bothered with. On top of that the thought of getting it wrong and looking orange/streaky which I have seen on people more times than I could count, scares me a lot. But I will try my best to give it a go and see how I get on. Even though I currently own a Cocoa Brown Tanning travel set in my bathroom which I brought with me from Ireland and it hasn't been touched once. So if I actually use this up it will be a miracle. I'll let you know how I get on with it! You should look into next month's box as it has an even higher value then this one! I have heard the St Tropez is pretty awesome!! And I've tried that shampoo before, it's pretty great! I always felt the same about subscription boxes but you have tempted me to get this, all products I'd love to try! Also I love your photos (I'm a sucker for a good photograph of the products mentioned) you're a pro! Well firstly, these photos are so beautiful and I love how you've positioned the red rose! I love the Jurlique inclusion :) Have a wonderful week!